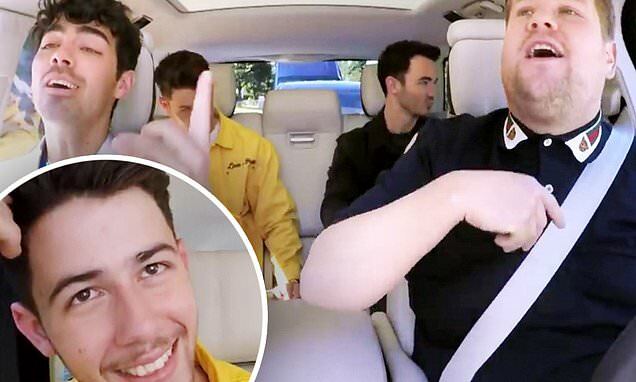 The Jonas Brothers were subjected to a surprise lie detector test while participating in a Carpool Karaoke segment that aired Thursday on The Late Late Show on CBS. Talk show host James Corden, 14, after picking up Joe, Kevin and Nick on his ride to work turned up the tunes and they all sang Burning Up together. 'And then in that, we started saying that there was a magic when we were together that we would all love to feel again,' he added. Nick opened up about their 'forced therapy' and said it included writing down questions in a bowl and picking them out. He said one of the questions included, 'Why do you think the band ended?' and James quickly put the blame on him as his brothers playfully agreed. 'I broke the bandup, but I got us together again,' Nick admitted.